The way to sustain growth in the chemicals industry is to continue developing more differentiated, higher value products; continue creating strong brand identities; and continue upgrading to stay ahead of the curve, said a senior official. 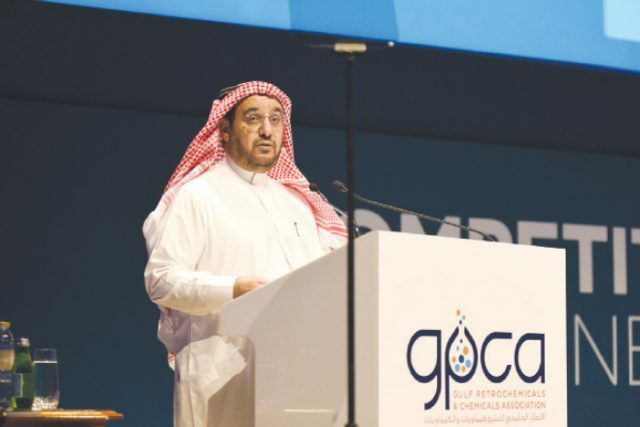 Abdulaziz Judaimi, business line head of Downstream, Saudi Aramco, was delivering a keynote speech at the 11th Annual Gulf Petrochemicals and Chemicals Association (GPCA) Forum in Dubai, UAE. In his speech, Judaimi touched upon market conditions, the economic drivers of change in the region and the pivotal role of the chemical industry in adding tremendous value to the overall global energy landscape. He added, for more than 80 years, the region’s pre-eminence in the global upstream sector has been the bedrock of its strength and allowed the region to become a global petrochemicals hub. However, he stressed that the region was at a development point where it cannot continue to depend on a single economic engine. “Instead, the development of the non-oil private sector, including the chemicals industry, has become a strategic necessity for the region,” said Judaimi. Having in place the right strategies would enable the chemicals industry to shift gears rapidly and take its place on the pedestal of the overall energy industry. “Clearly, there will continue to be opportunities to invest in the large-scale integrated base petrochemicals projects, underpinned by advantaged feedstocks, which have defined the development of our region’s chemical industry,” said Judaimi. He added that all these were encapsulated in Saudi Aramco’s downstream strategy, reflecting its leadership role in chemicals as an economic and social driver to achieve the development objectives of Saudi Vision 2030. Judaimi outlined four key areas which can be achieved under in the industry’s collective efforts. First, refining-petrochemicals integration where he emphasized the importance of a better balance and integration of the upstream and downstream businesses. “A base level of integration can be achieved by adding value through shared infrastructure, utilities, and services, without compromising operations on either side. Higher levels of integration can be achieved with stream transfers, capital improvements that benefit both refineries and chemicals, and overall site optimization of operations,” he said. He said that in 2017, nine of Saudi Aramco’s 15 refineries will produce chemicals, with conversion rates that can go to 20 percent of the total crude processed. The second focus area involved differentiated commodities and specialty chemicals where far greater expansion is needed. That was the idea behind Sadara Chemical Company, Saudi Aramco’s joint venture with The Dow Chemical Company and ARLANXEO, Saudi Aramco’s joint venture with Lanxess of Germany. “Production differentiation, by contrast, brings added value and a higher degree of margin stability,” he said. Third is innovation and technology to enhance processes and create new products and industries. Judaimi said that some of the company’s most recent achievements are the results of partnerships to create value through innovation such as Saudi Aramco’s joint efforts with SABIC to study the conversion of crude oil directly to high-value petrochemicals as well as the company’s recent acquisition of the Converge polyol technology from Novomer. The final and fourth area is talent. According to Judaimi, without a highly skilled workforce none of the efforts to change will work. The Gulf Petrochemicals and Chemicals Association (GPCA) represents the downstream hydrocarbon industry in the Arabian Gulf. Established in 2006, the association voices the common interests of more than 250 member companies from the chemical and allied industries, accounting for over 95 per cent of chemical output in the Gulf region. The industry makes up the second largest manufacturing sector in the region, producing up to US$108 billion worth of products a year.